New Spring 2011 Books! Craft your heart out! 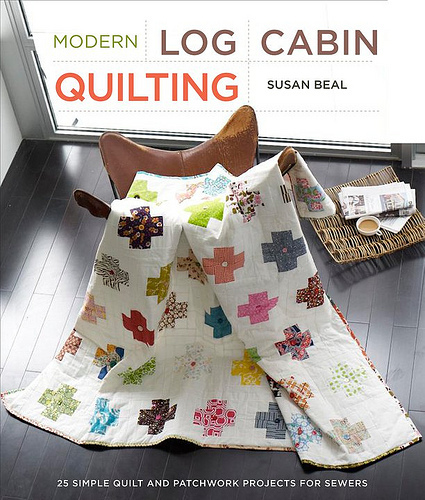 Also new and exciting is the Modern Log Cabin Quilting by Susan Beal. This book has lots of amazing projects using the easy and versatile log cabin design. You will love it! We love Meg McElwee! She is the woman behind the Sew Liberated patterns and her first book Sew Liberated contains tons of awesome patterns. 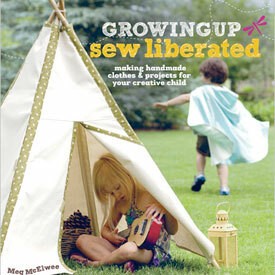 Meg's newest book, Growing Up Sew Liberated is one of the most adorable kids sewing books of all time. 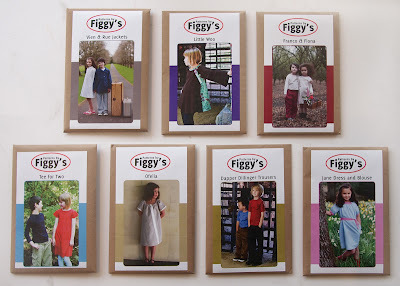 This book has everything from tee-pees to toys to clothes to baby slings. My favorite though, is the Reversible Hooded Play Cape - it's sure to make all magical dreams come true! 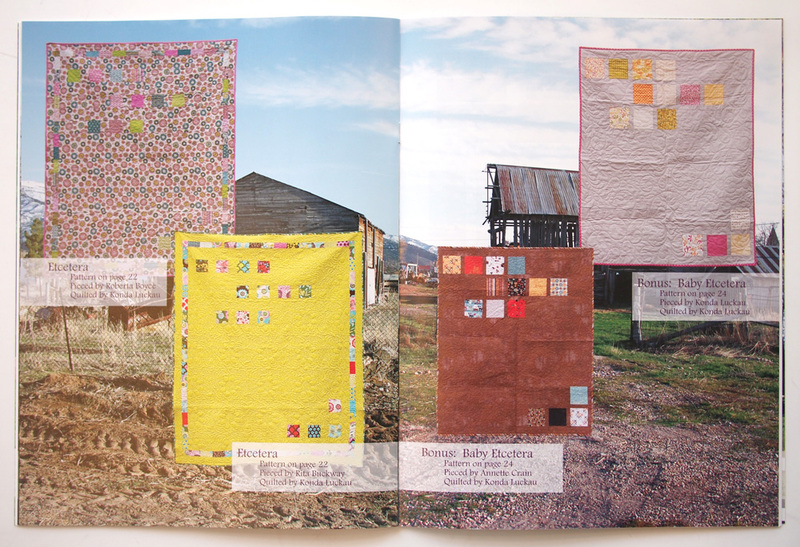 Harvesting Color is a new natural dyeing book that we love! It is awesome because it teaches you how to harvest your own natural dye plants and materials so you don't have to rely on purchasing natural dyes that are often coming from far away places. 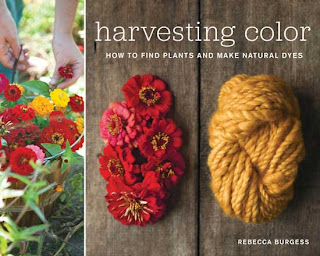 Now you can dye yarns with plants from your backyard using this colorful and environmentally conscious book. Author Rebecca Burgess even teaches you how to make your own mordant from rusty objects. Vintage Modern Knits is a new book from Interweave that features vintage inspired patterns, updated for modern fit and yarns. 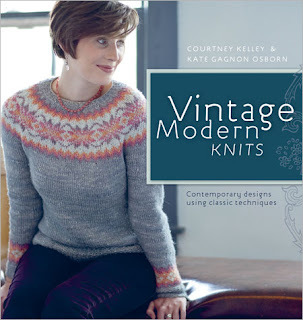 We love that it includes a pattern for a traditional and olde-fashioned Gansey! Just in case you missed it - Knit. Sock. Love. 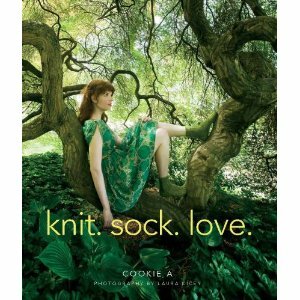 by Cookie A is hands down the most exciting sock book to be released in many months. It still has us knitting and dreaming of socks all day long! 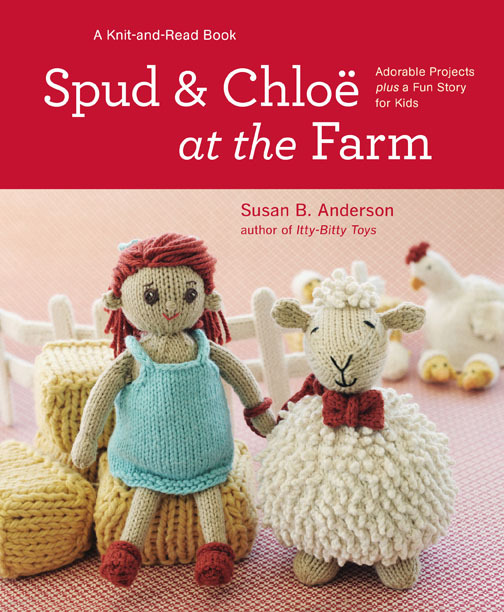 Spud and Chloe at the Farm is an adorable picture book style story featuring patterns by designer Susan B. Anderson for all your favorite farm dwellers. So...we don't really have supplies for terrariums (check out our new neighbor Ironwood for that! ), but we couldn't resist this beautiful and informative new book on building your own terrarium. 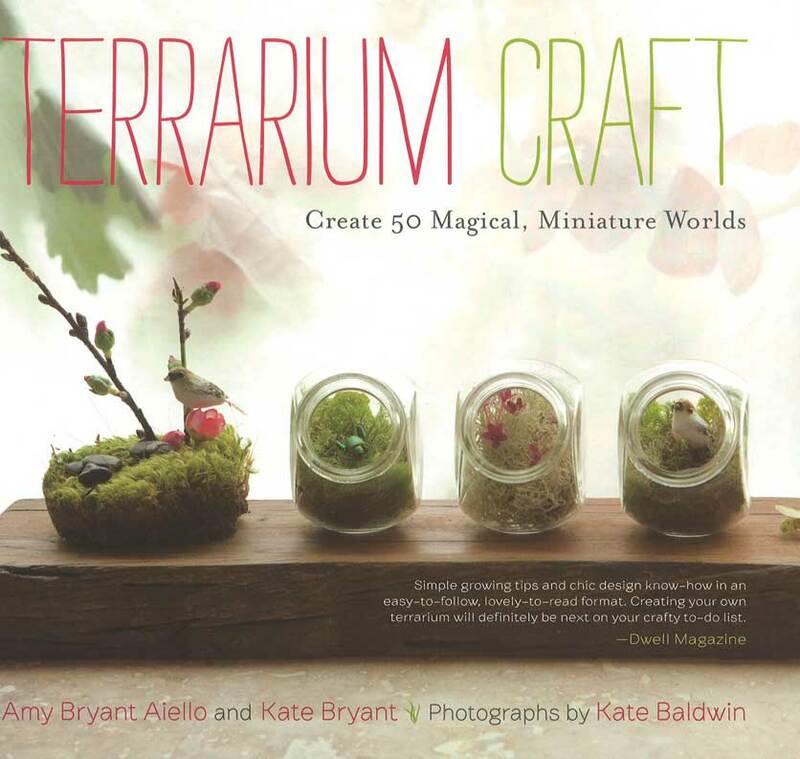 This includes information about different plants and habitats and crafting terrariums from found household objects! New Sewing & Quilting Patterns Galore! 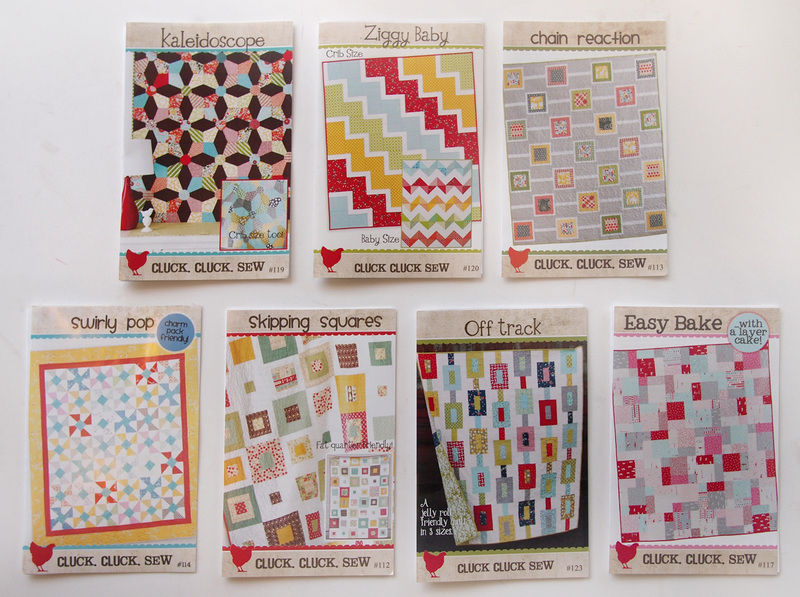 We are excited about all the independent sewing and quilting patterns we brought back from Quilt Market! Here is the scoop on what's brand new at Fancy Tiger Crafts! 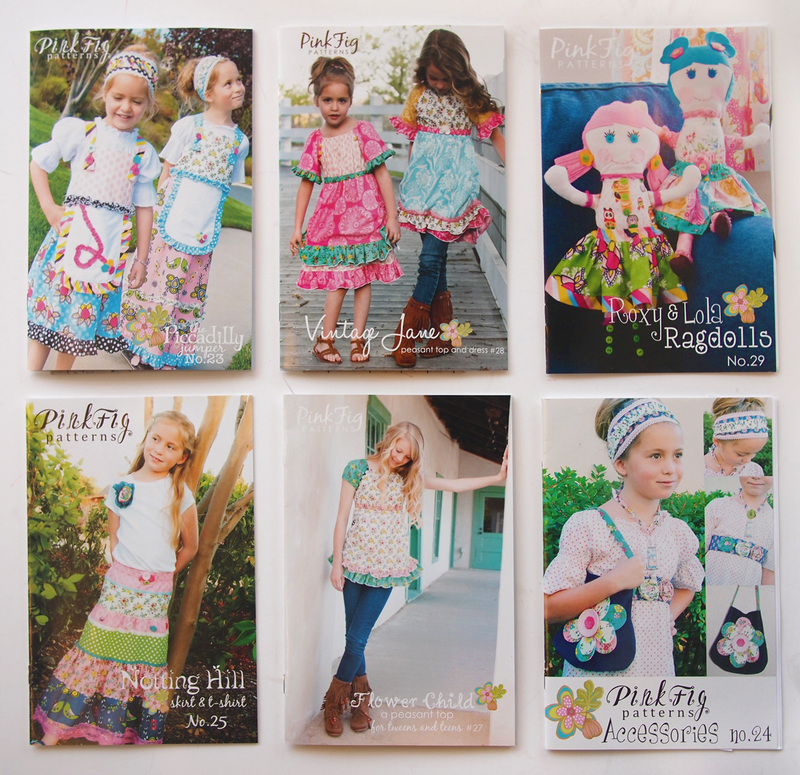 These darling children's sewing patterns have a classic look. 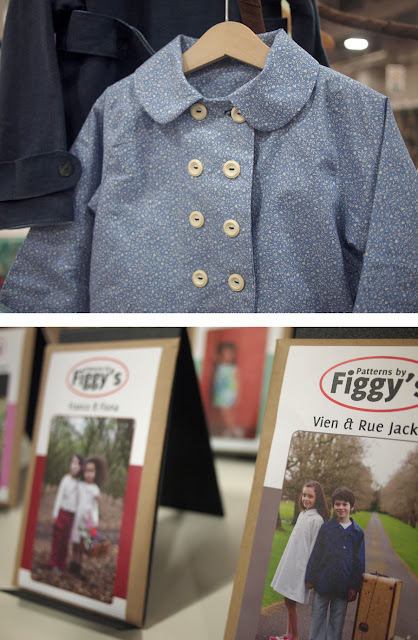 Figgy's includes pea-coat style jackets, asymmetrical vest and tees, classic trousers and simple dress patterns. 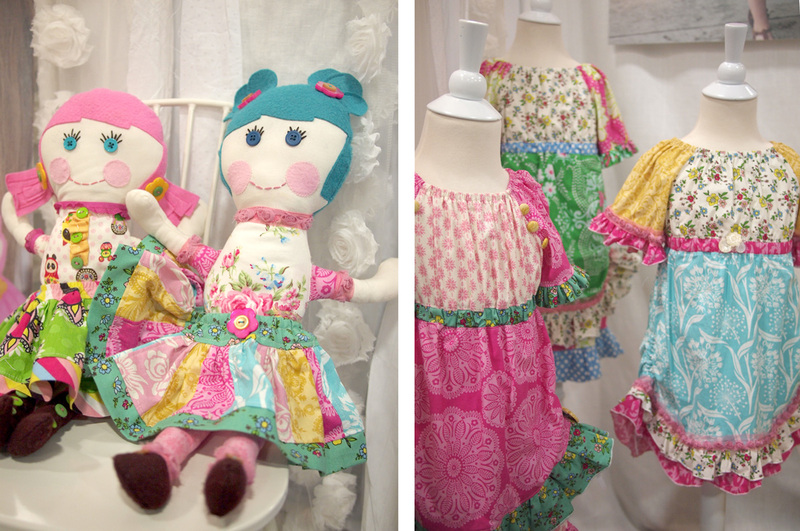 Four of the patterns are unisex and feature boys and girls styles so they're sure to please everyone in your family! 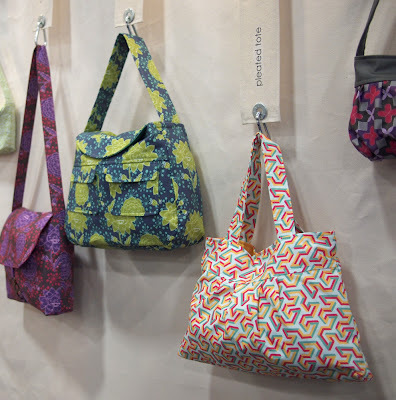 We loved Jen Giddens bag patterns the moment we saw them. 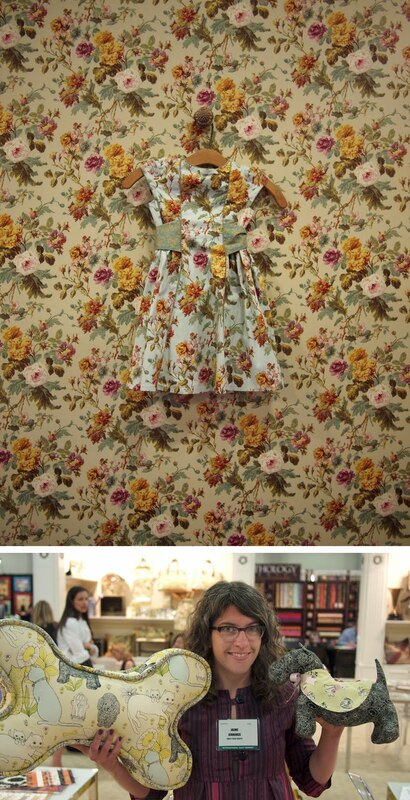 We were really intrigued with the fabric her samples were sewn up in that she had designed and printed herself. After talking with Jen a bit we learned that she was in the process of moving from Utah to Denver so guess what?! She is a local pattern designer! We couldn't be more proud to claim her as a Denverite - yay for us! 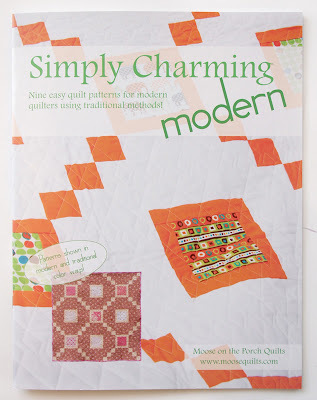 We haven't carried any quilting pattern booklets up until we saw this beautiful "Simply Charming Modern" book by Moose on the Porch Quilts. This is the first time we've seen a booklet chock full of amazing quilt patterns - each one is shown in more traditional fabric choices as well as a modern take. 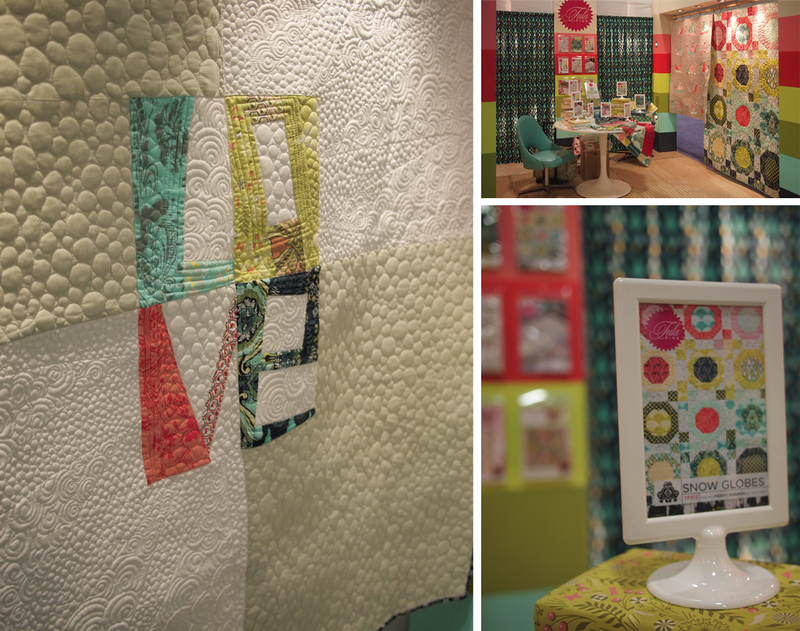 We loved the quilts she had on display in her booth - they really inspired us to try more daring quilt patterns. Sew many new patterns! I hope you have been as inspired as we are to make this summer all about sewing! 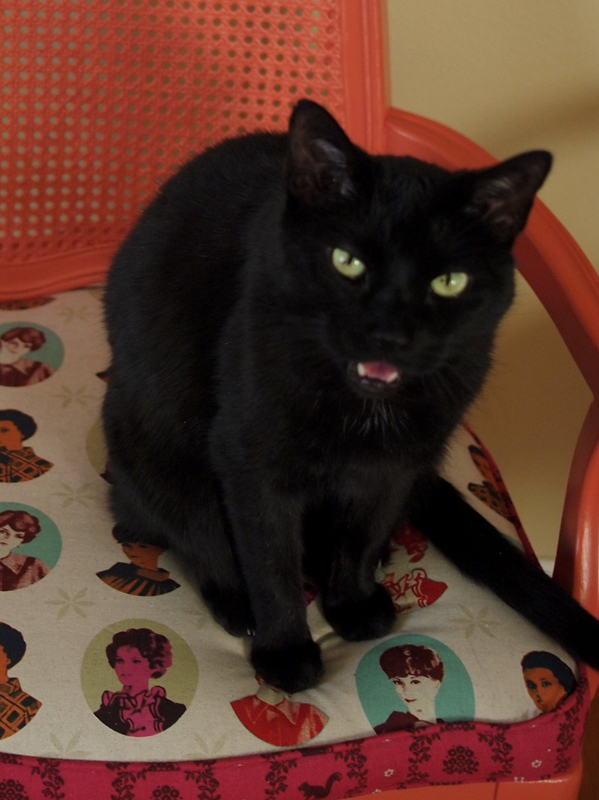 You might remember Dusty, who made his first appearance on the Fancy Tiger Crafts blog modeling with my Parisville quilt. Dusty belongs to my mom, who has been breeding and showing Skye Terriers for over 40 years. Ch. 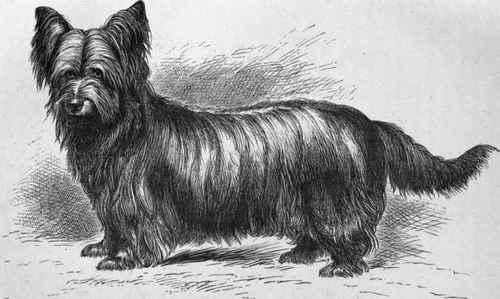 Royalist Dust Devil "Dusty"
Skye Terriers are a rare breed of terrier that originated on the Isle of Skye in Scotland and are one of the oldest terrier breeds. They have changed little since their beginnings as ground vermin hunters and still retain their long coat (for protection) and long bodies (for getting into small spaces). Because Skye Terriers are such a rare breed of dog, Skye "paraphernalia" is hard to come by. For this reason, crafting is perfect. 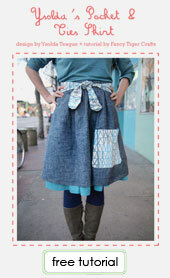 You can make all the Skyes you want - sewn Skyes, knit Skyes, felted Skyes - the sky's the limit! 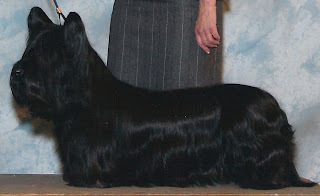 The problem, of course is finding patterns, so for rare breeds or adorable mutts, it might be necessary to create your own. When the new book Knit Your Own Dog came out featuring knitting patterns for 25 dog breeds, I knew there would be a pattern I could work with to knit my mom a Skye. 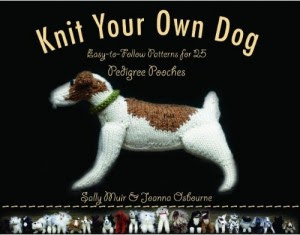 The 25 breeds featured in Knit Your Own Dog cover everything from wrinkly little pugs to sleek and muscular whippets, so dog lovers will be sure to be able to craft their favorite canine friend! Sure enough, the Corgi pattern was perfect for the general long and low body shape of the Skye. 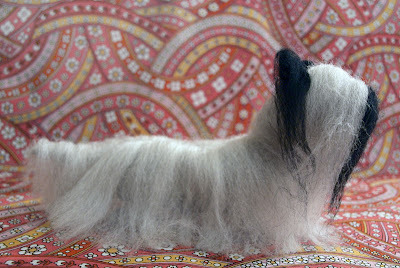 I used the loop method described for other breeds like Afghan hounds to add long hair and we were good to go - a completely cute knit Skye terrier! 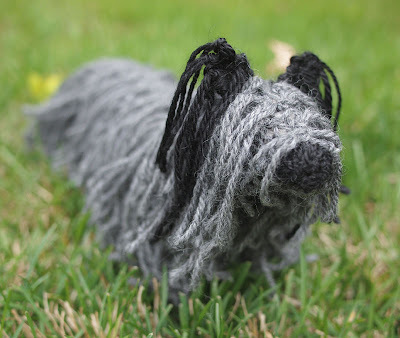 My mom (who is responsible for my crafting addictions) has also made her share of handcrafted Skye Terriers. She whipped up this beautiful needlefelted specimen. Needlefelting is perfect for making animals and is a great free-form craft that you can easily experiment with to make any breed of friend. Yay for crafting and Skye Terriers! In the (almost) 5 years that I've been an owner of Fancy Tiger Crafts I have done all sorts of things with the wonderful crafts supplies we have here, but I have never used our fabrics for an upholstery project. We recently got a new couch which of course, turned into painting our whole house. When we painted our living room a soft gold, our pale 1970's Italian provincial chairs just faded into the walls so we decided it was time to re-do them. My friend Brandy chose the color and I was instantly in love with the bright corally-orange. She painted the chairs using a semi-gloss paint so they are super bright and shiny. 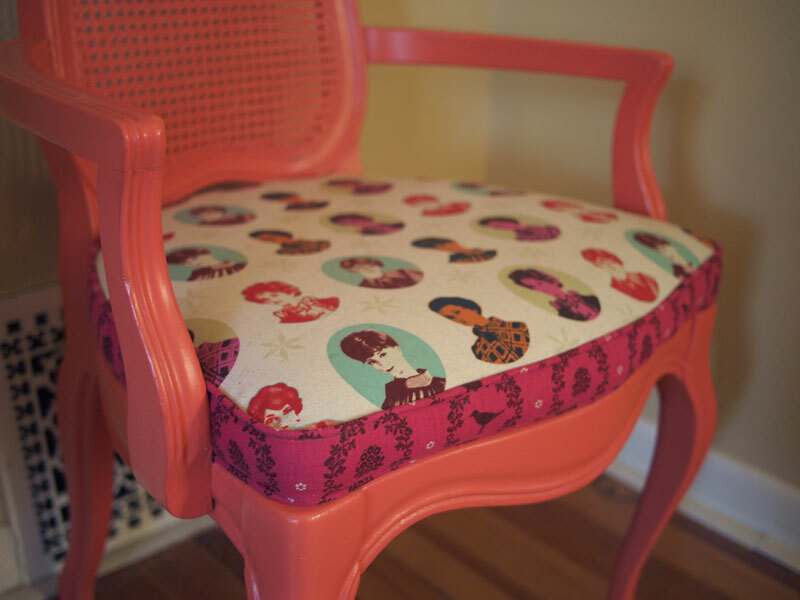 I took the paint sample to work and it didn't take long to chose one of my favorite Melody Miller prints from her Ruby Star Rising collection for the cushions. 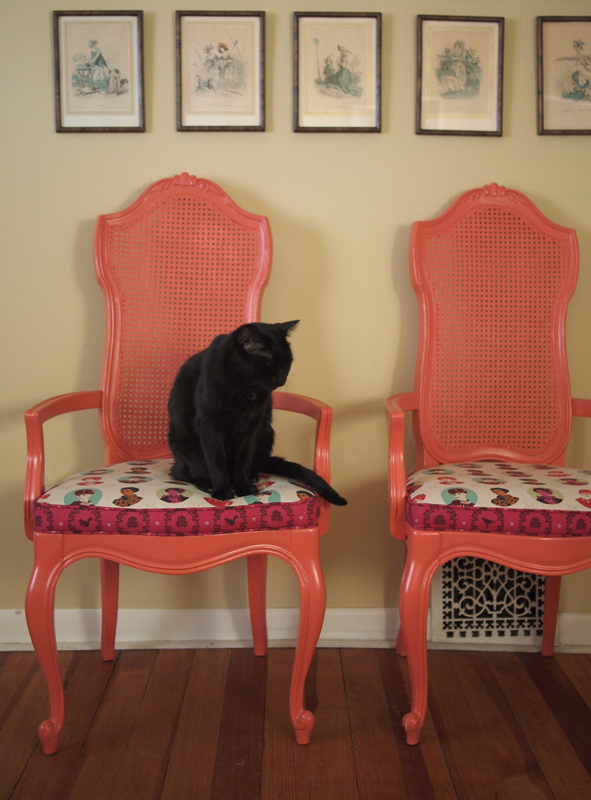 I was worried about the white background print getting dirty on the piping so I chose a pink Echino print for the piping and sides that clashes wonderfully with the coral chairs. A family friend has an upholstery studio in Nebraska and she did an amazing job re-doing the cushions for me. The result is an eye-catching centerpiece for the room. I love them! 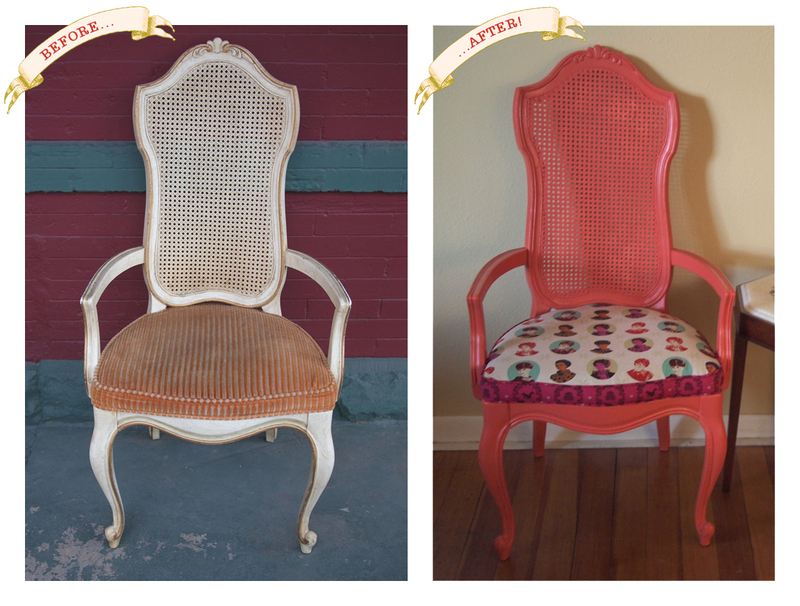 I am super excited about re-upholstering these chairs every 6 months or so just to keep up with all the amazing fabrics we have! 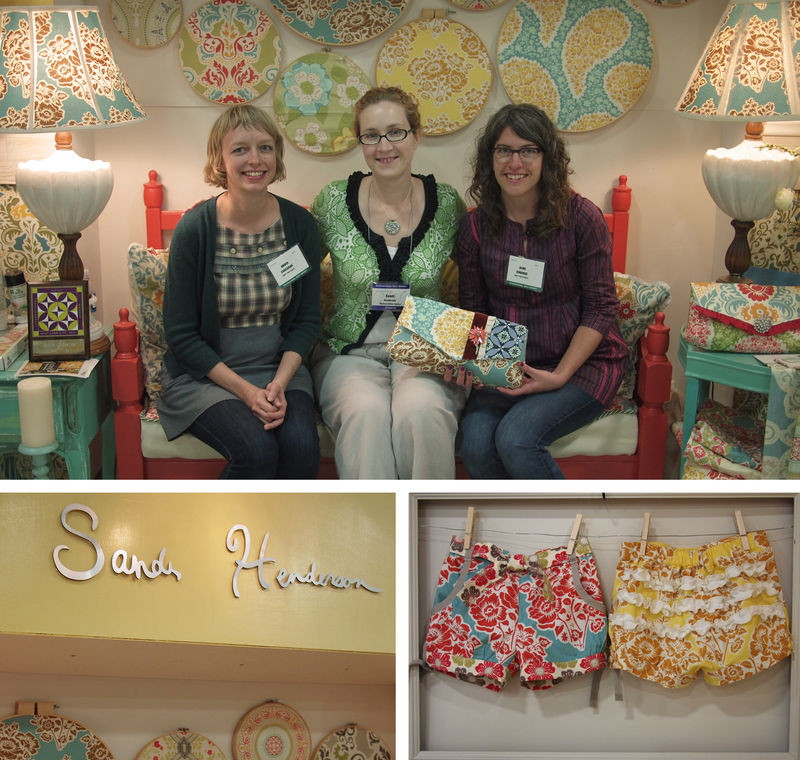 Amber and I just got back from Salt Lake City, Utah for the 2011 Spring Quilt Market! Salt Lake City was beautiful. We enjoyed excellent weather and were treated to great food and friendly faces everywhere we went. Here's our report on all the amazing upcoming new fabrics! We were super excited to see Lizzy House again. 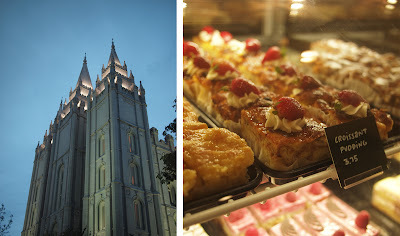 Lizzy calls SLC home, so she had lots of great recommendations of where to go and took us to some great spots. 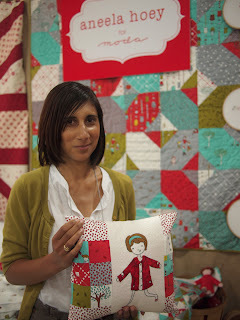 Lizzy's booth was beautiful with her brand new 1,001 Peeps collection made up into gorgeous quilts! 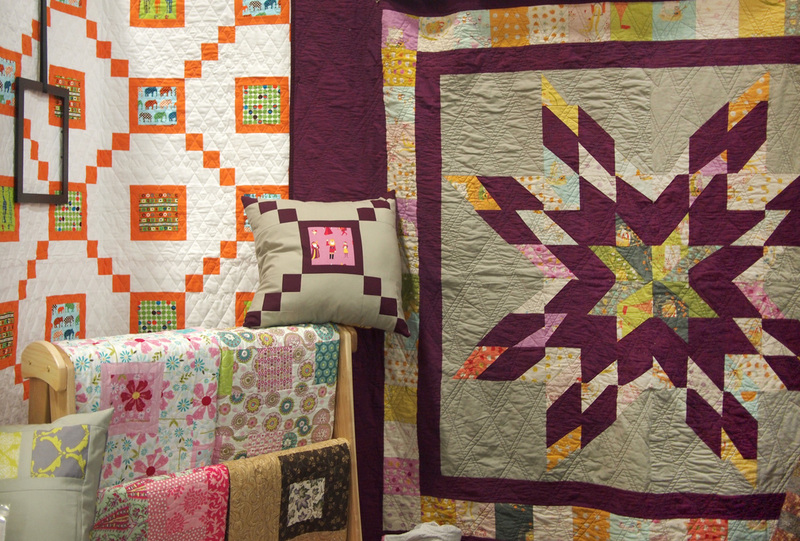 The patterns for these quilts will be in her new book coming out this summer and the 1,001 Peeps fabrics should be here any day. We also got a sneak peak at her Outfoxed line coming out this fall. 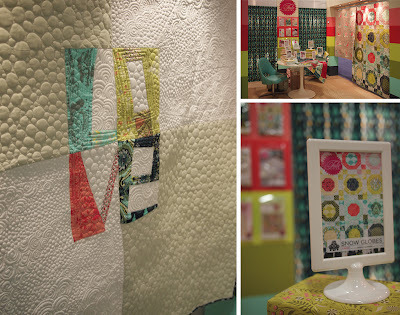 The organic fabric company Birch Fabrics has some great new collections coming out. 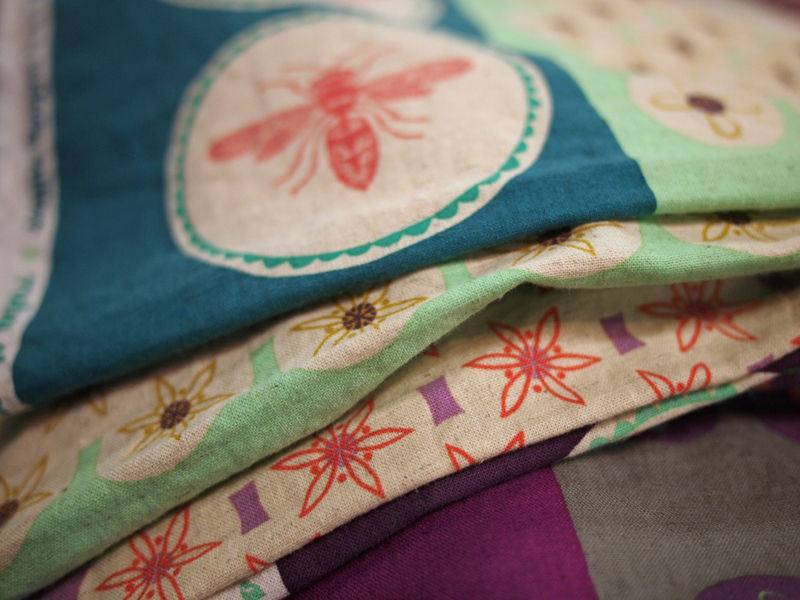 The Avalon collection will be here soon and we love that it features bikes - we can't get enough bike fabric. Later this summer, look forward to their sweet, Scandinavian, Storyboek collection with beautiful soft colors. 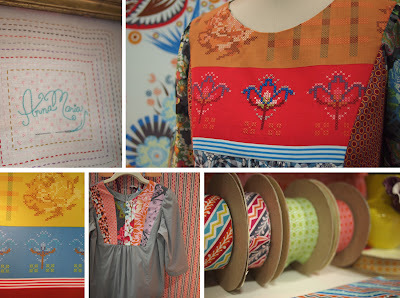 Moda fabrics always a great booth and this year was no exception. We were really excited about using their photo booth which we took advantage of several times. We also got to spin a wheel and won a sweet wet/dry vac. Thanks Moda! 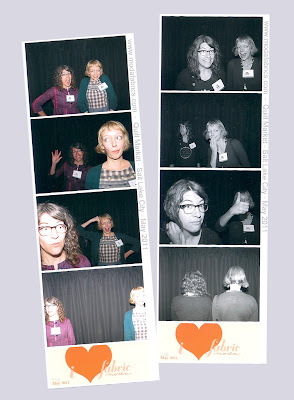 The Moda photo booth was soo fun! Here we are winning a prize with our wonderful rep, Melody! We loved the Northcote Range collection by Cabbages and Roses which features super pale roses on pale background - lovely! 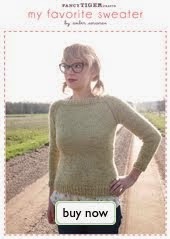 We also can't wait to get the new Aneela Hoey collection Little Apples this fall. It will be perfect for back-to-school outfits! 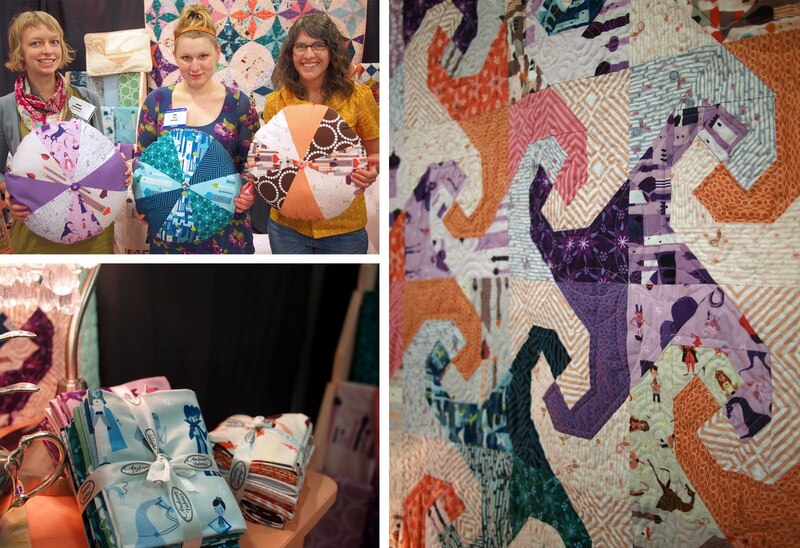 Quilt Market is our one chance every season to check out the Japanese fabrics from Yuwa. Yuwa produces some our favorite fabrics of all time and this season was no exception. 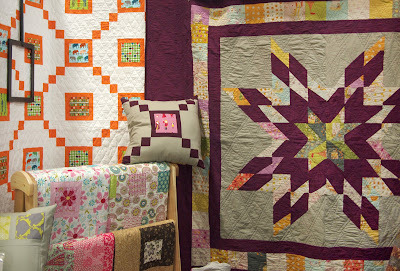 We were floored by the new collection from Japanese quilt designer Yoshiko Jinzenji. Jinzenji's fabrics are abstract prints on a huge scale with sparse and interesting color combinations. This fabric is so unique, we think you will love it! Anna Griffin is known for her stunning florals and she did not disappoint. 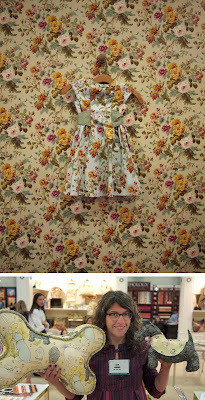 This floral dress sample displayed on floral wallpaper was one of my favorite things from quilt market - beautiful! 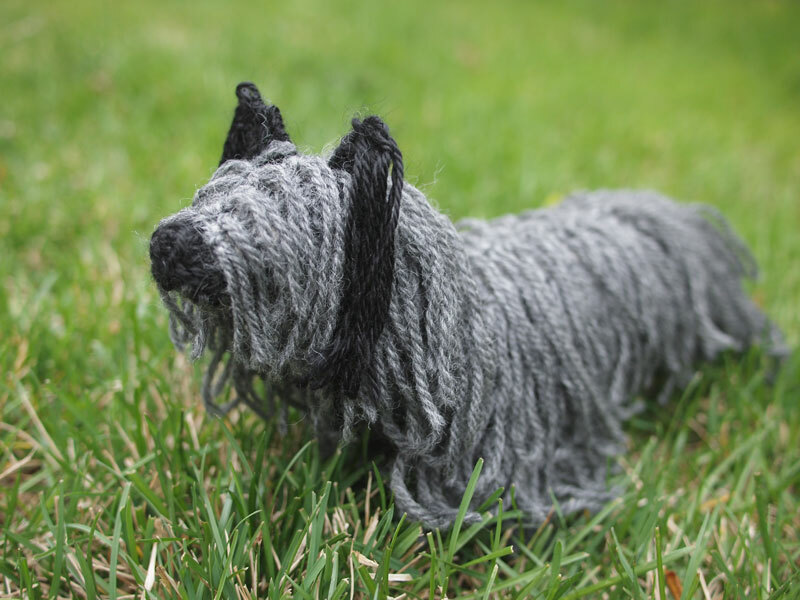 She is also releasing new patterns to work with the recent Fifi and Fido collection so you can sew a bone pillow for your pup friends or make a miniature Scottie dog. We finally met Joel Dewberry! Joel Dewberry and his wife Laurie were so charming. Joel's new collection, Heirloom includes some of his signature color combinations, but we were pleased to see him exploring new colors as well. As always, the results are fantastic and we can't wait for them to get here in July! Laurie has designed some sweet new patterns for adult garments and bags that we will soon be out with Heirloom. Tula Pink already has another collection coming out! We are still recovering from the amazing-ness that was Parisville and now we are ready for Prince Charming. Prince Charming is another stellar collection and guess what? There will be voiles. 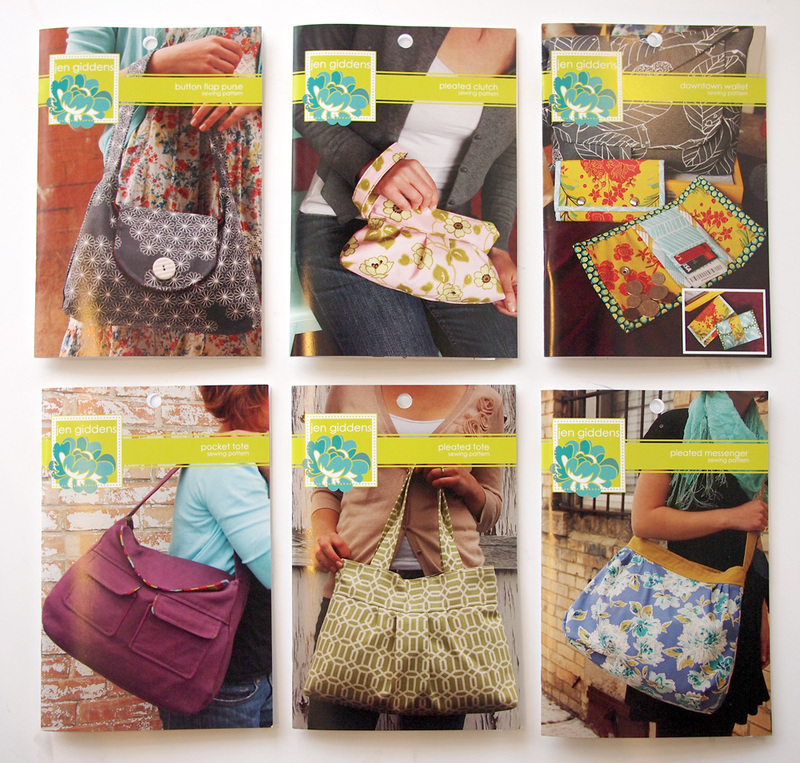 That's right - now we can have luscious fashion fabric from all of our favorite designers! Tula Pink's booth was amazing as always (she even won a prize for it!) 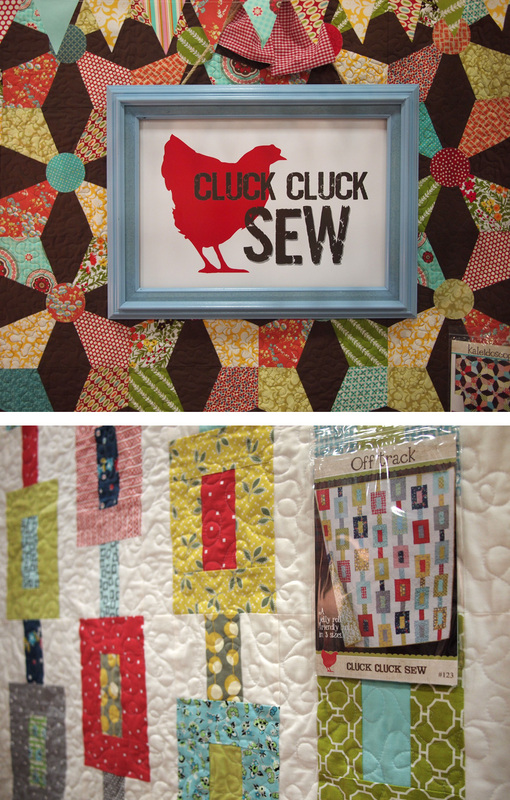 and she showed off the new fabrics in her fun new quilt patterns. 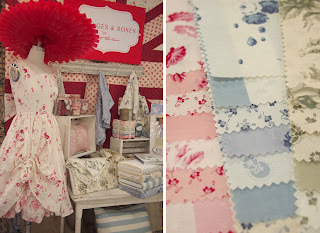 Michael Miller fabrics has some exciting things going on. 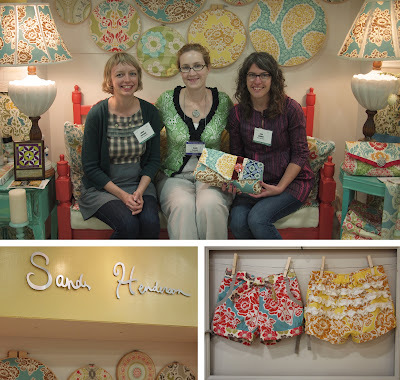 Sandi Henderson has a new collection coming out called Secret Garden that is going to be amazing. We feel this is her best collection to date and can hardly wait to get our hands on it! Sandi also won a best booth award! SarahJane is a new designer for Michael Miller. 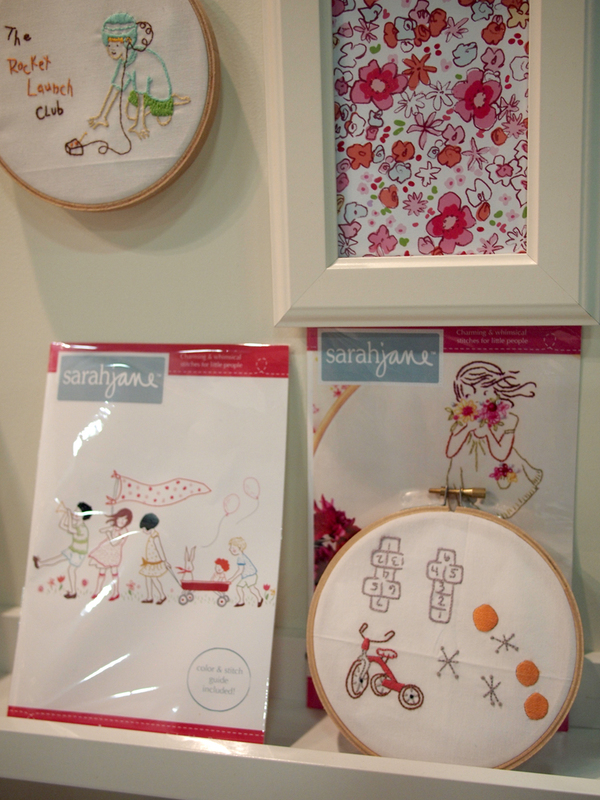 In addition to her first collection, Children at Play, she also has adorable embroidery patterns. Yay for embroidery! Echino has another Nico line coming out featuring cars, buses, scooters and London in her signature bright colors. 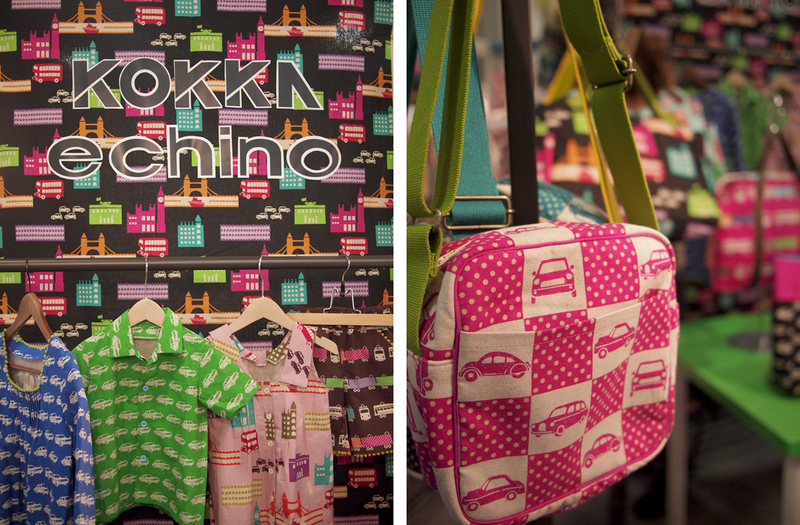 We also ordered the Echino webbing in bold coordinating colors for all your bag-making needs. 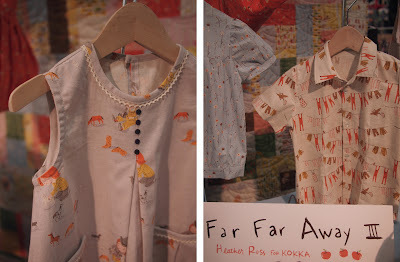 Heather Ross has a new collection, Far Far Away 3. This is my favorite one yet because in addition to her sweet fairytale prints, there are prints of little girls playing with horses (eek!). Don't worry - we ordered it all. Melody Miller was new last Quilt Market, but she has fast become a favorite of ours. Her newest collection is soo awesome! We are already hyperventilating because there are only 6 prints (all 62" wide sheeting!) so keep your eyes out for when they arrive - they are sure to go fast. 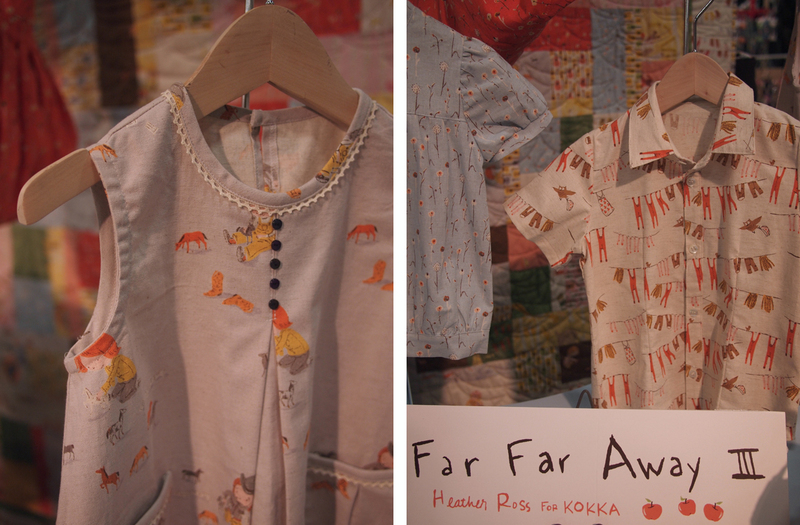 Also new and exciting from Seven Islands are a new Nani Iro collection and (drum roll please...) Hello Kitty fabric! So what does this all mean? It means that this summer and fall will be amazing! 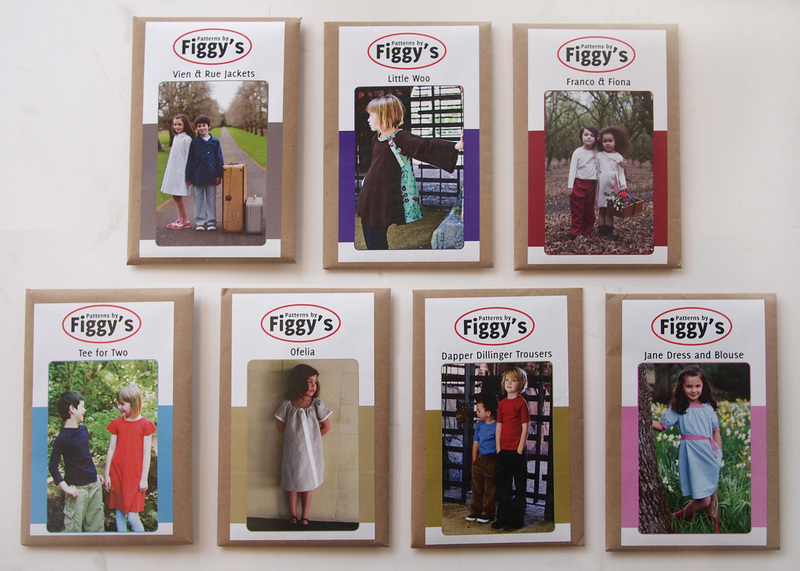 We will keep you updated though this blog and facebook as all these new fabrics arrive... stay tuned next week to hear about all the new patterns we brought back. 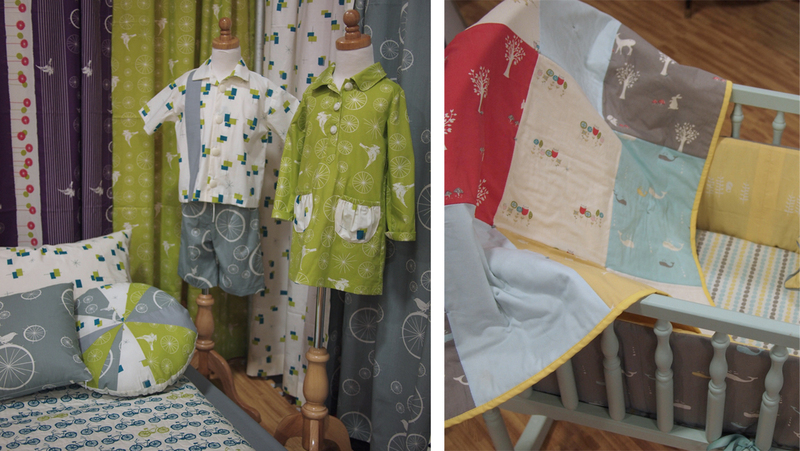 If you've been thinking of taking up sewing, now is the time people! 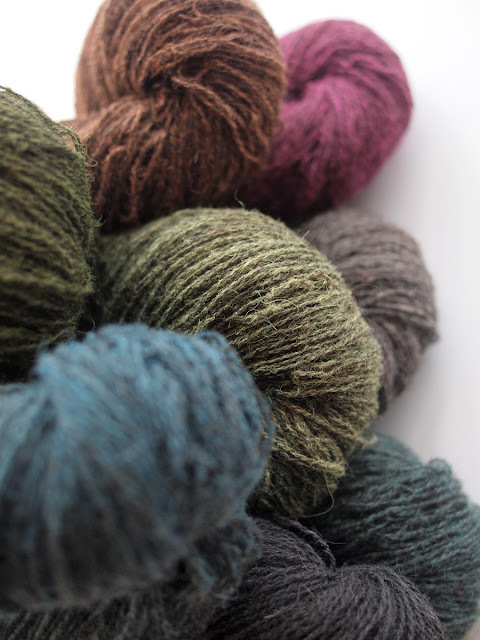 New US Shetland Rustic Lace Yarn! Elemental Affects new Rustic Shetland Lace has got everything we love going on. It is US raised and milled heritage breed fiber from the adorably tiny Shetland sheep. 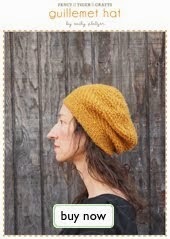 The yarn is crunchy in all the right ways and has a beautiful texture that is unique to small batch yarns. The yarn is over-dyed, the dye layered on top of the heathered brown-grey of the sheep's natural color which gives it a lovely depth. 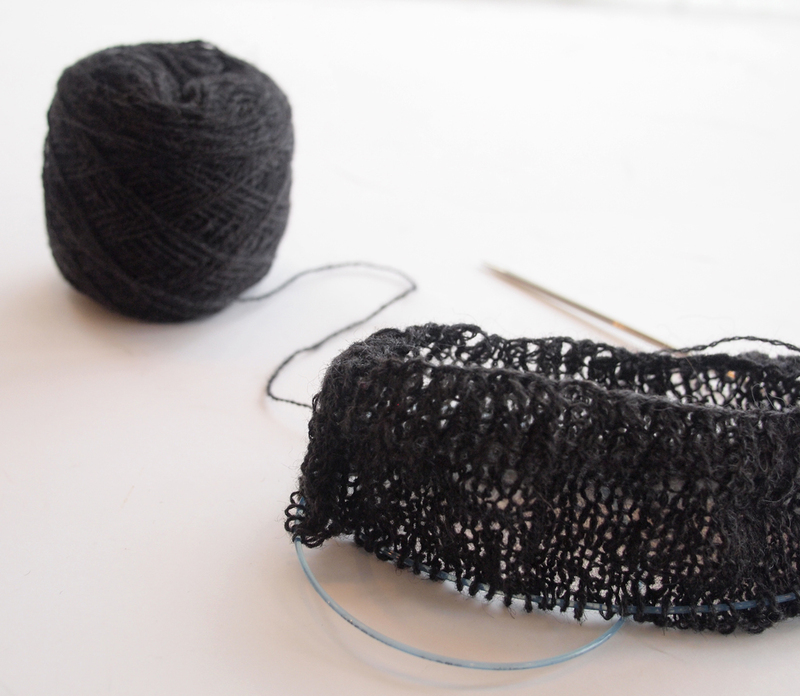 Jaime has already cast on for a Wispy Cardi (a popular pattern around here lately), which will only take one skein of the Rustic Lace! I am totally obsessed, and from the projects I've see other folks working on around here lately--yellow bags and sweaters and shawls and dresses--I don't think I'm the only one under yellow's spell. I've been fixated on this color for a while and it has been over the course of a year that I have collected the 42 fabrics used in my newest quilt. This is my most massive quilt yet at 110" square--in fact, the 9' high walls of the Cherry Creek bike path were no match for the size of this quilt! 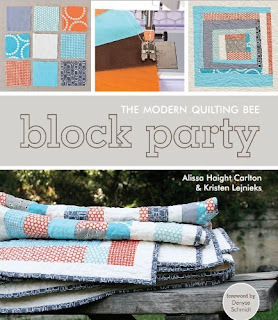 The piecing was inspired by the little hand-sewn, paper-pieced hexagons that I've often seen very patient people working on at craft night. 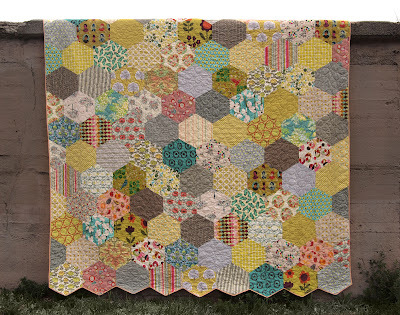 I marvel at the teeny-tiny 1-1/2" hexagons and the preciseness of the basting and hand stitching! I decided to mimic the look of those hexagons on a larger scale. My big ol' hexagons are a foot across each. There is a little secret to my piecing that I'll share with you now. 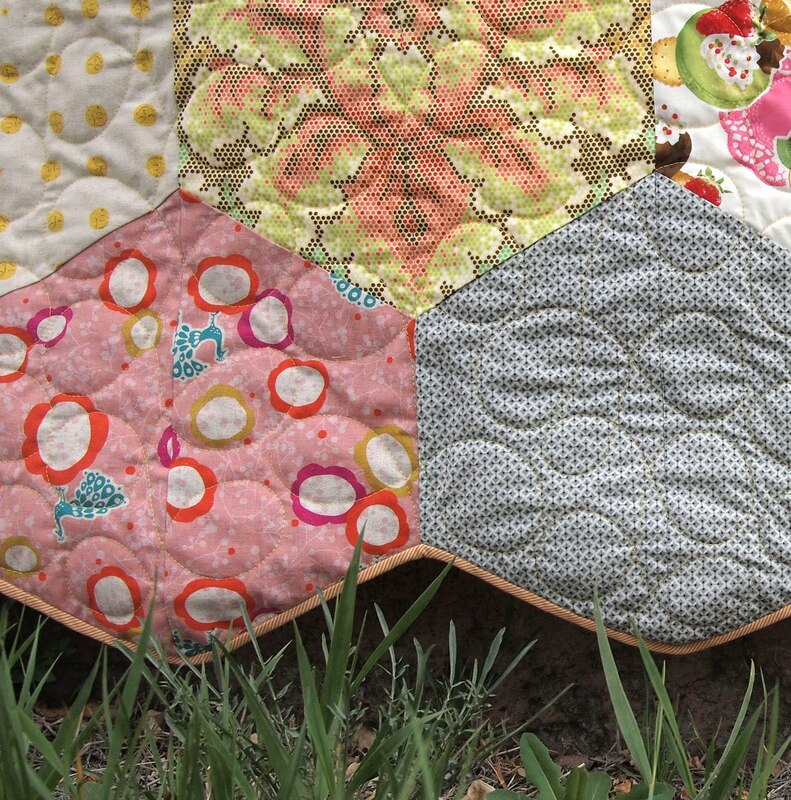 If you look closely you may notice these hexagons are actually half-hexagons. They are mercilessly sliced down the middle so that the piecing of the quilt can be done in straight strips instead of having to stitch corners. 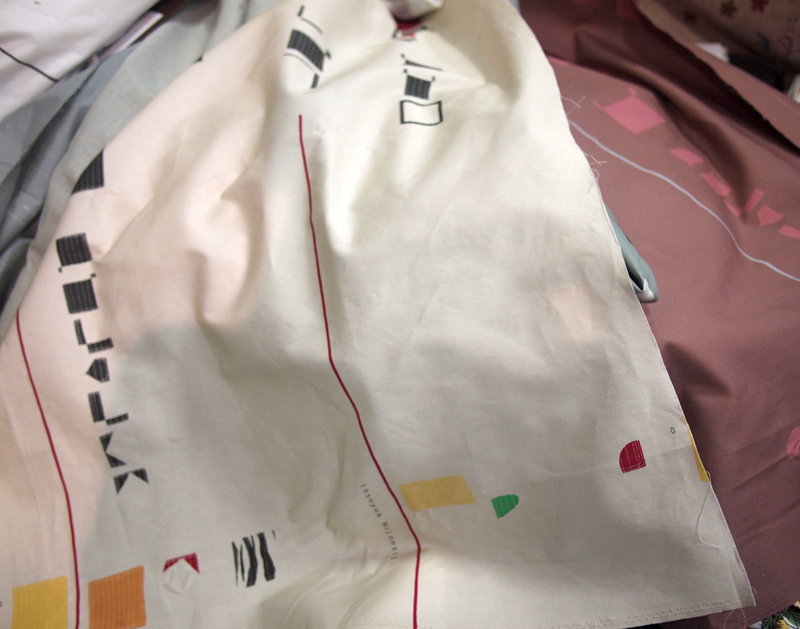 The pieces are matched back up with their partners when you sew the strips together. 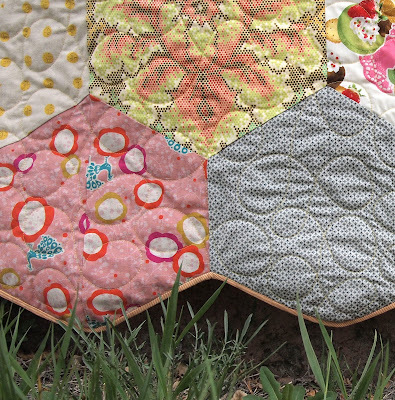 This little trick makes hexagons easy-peasy! I chose the tiniest orange pinstripe print for the binding and cut my strips on the bias to make sure I could work my way around the hexagon points. 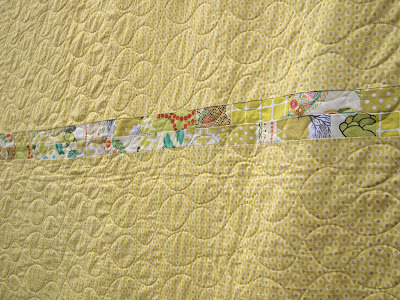 I really got my yellow fix on the back of the quilt. 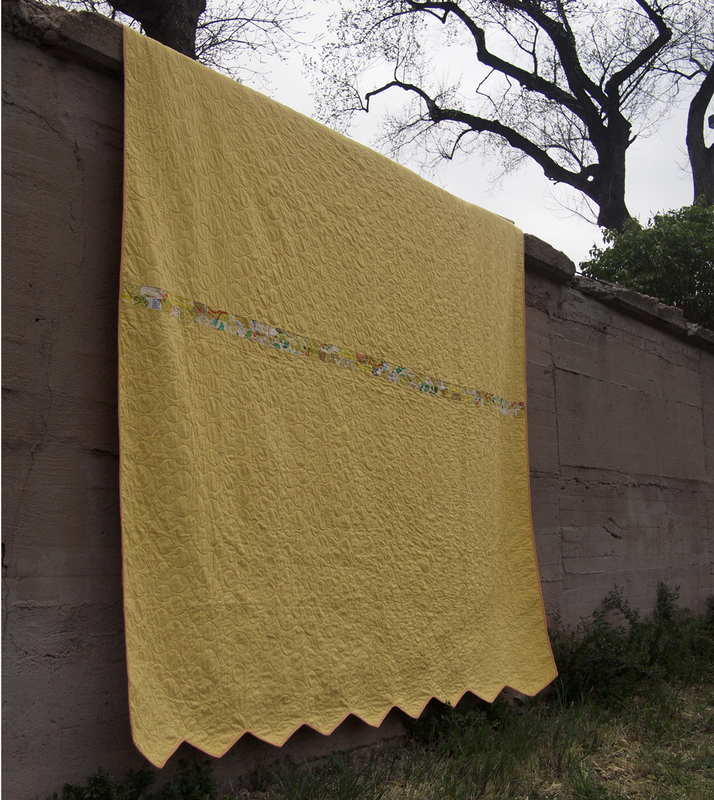 I love this sunny yellow polka dot from Art Gallery fabrics. 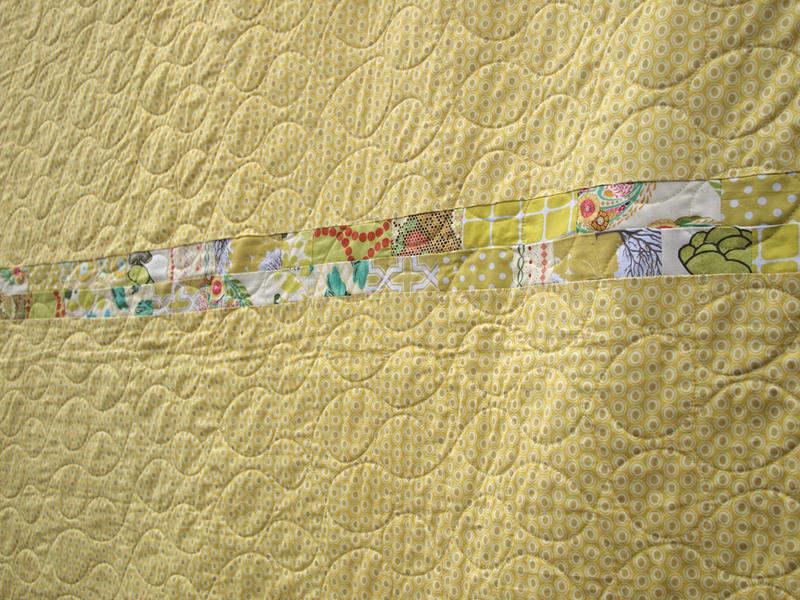 There is one adorable little scrappy patchwork strip right down the center of the quilt back. It makes me happy. 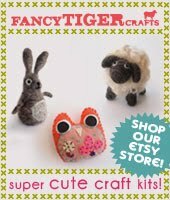 Fancy Tiger Crafts in Sunset Magazine!